For months, I’ve been using Google’s Inbox as my email app of choice. While I fully understand that this app or its approach to email is not for everyone, as someone who spent just as long with Mailbox before Inbox, I have fully embraced email clients that turn your inbox into a task manager. I actually feel like I get more done, respond to emails much quicker than in the past, and generally, find myself grunting and groaning far less when a new message appears. With that in mind, there are little things (like this and this and this) about Google’s Inbox that have helped make this my favorite email app. One of those is this really subtle swipe gesture that gets you in and out of emails or bundles. You’ll see it in the GIF below, but basically, this gesture can be a natural extension of how you already use the app. For example, as you scroll through a long email, your thumb can simply continue that swipe up motion to get you out of the current email and back to the last screen (assuming you don’t feel like replying). Or, if you are scrolling through a list of bundled emails, the same idea applies – continue swiping up until it swipes you back to your main inbox. 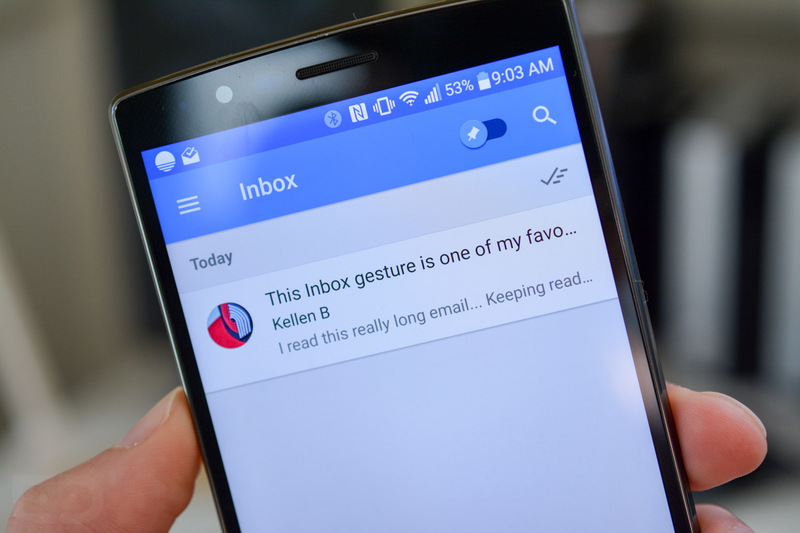 The gesture also works if you swipe downward from the top of an email or the top of a bundle. I love this gesture so much because it really is just an extension of a motion that you are already completing when using the app. You don’t have to think about it or switch swipe directions. It also allows you to avoid having to find your phone’s back button, since even in 2015, phone manufacturers can’t seem to settle on a damn arrangement (we’re mostly looking at you, Samsung). This gesture was at one time in Google Play app listings where you were viewing descriptions and “What’s New” for apps, but Google seems to have removed it for whatever reason. This is one of those little UX touches that really makes an app standout. I hope Google considers adding this to the standard Gmail client, brings it back to Google Play, and finds ways to integrate it into other apps as well.